While the artist weaves together both representation and abstraction, he also melds architectural landscapes with still life, creating paintings steeped in prodigious antecedents. The characteristics of transparency and opacity are juxtaposed; creating puzzles that meld liquidity with solidity. 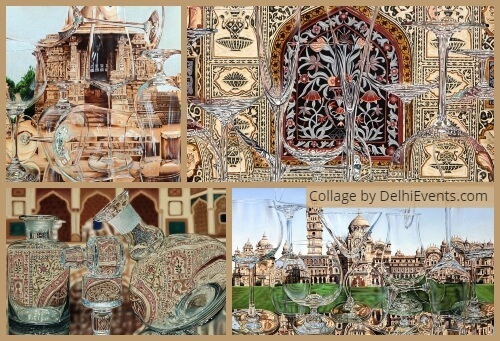 Portraits of some of India's best known Palaces and Monuments (the tombs of Isa Khan and Laxmi Vilas Palace, the Fatehpur Sikri Fort, Jaswant Thada Jodhpur and Sheesh Mahal Jaipur) are glimpsed through scrims of decorative glassware which turn their stoic masonry into a melting array of pigments. Khan indianizes the tradition of the Vanitas Vanitatum, the beginning of still life painting in Holland in the 16th Century, when collections of objects represented the fleeting nature of mortal existence and painters competed against each other for the most astute verisimilitude. The graceful domes of monuments in India have been captured in oil many times, but Tauseef Khan adds another layer of perception to the image. In his canvasses, the architecture is tactile, hyper-real and vivid, but shaped in places through the glass of a wine goblet. Through the screen of the glassware, light distorts, patterns are amplified and new shapes created, evoking something new altogether. Tauseef’s fabulous painting reminds you of a truth we all tend to overlook: each and everything we see is our perception of its reality. Tauseef’s Reflections series is an entire symphony built around this note. “Through my paintings, I want to explore the concept of constantly changing perceptions. For instance, the monuments of Delhi, which I often paint, are objects of grandeur and antiquity, but to me, they are also familiar markers of my home city, places I often visited with family and friends.” That mixed tone of wonderment and comfort is evident in the way Tauseef depicts historical architecture: bright, as if bathed in afternoon sunlight, immediate as if tactile. Panels of Mughal inlay work in marble and bejewelled stone are vividly presented in some paintings, and in others, the red sandstone of a temple seems so comfortably warm you’d want to touch it. Playing with light and time A striking aspect of Tauseef’s paintings is the deliberate attention drawn to the artifice of the image. He paints realistic objects, not for the sake of verisimilitude, but paradoxically to underscore their transient nature. “I am inspired by the masterworks of Dutch Still Life painting, with the amazing tables full of precious objects, fruit and flowers, which the painters rendered with photographic precision. I work to achieve the same sort of hyper-realism in my works, so that the painting is at once very real but also something illusionary,” he explains. Like the anamorphic distortions of the Old Dutch masters, who painted distorted skulls in otherwise hyper-realistic compositions, to remind the viewer of the temporary nature of life, Tauseef’s glass screens too seem to tell us that all things are a function of time. experience been conventional. Unlike many other artists, Tauseef finished his MFA only recently, after two decades of working as a professional artist. The largely self-taught painter chose to learn in an iterant manner before that, absorbing inputs and insights from workshops, lectures and short courses. “At the Triveni Kala Sangam, I worked under great artists like Rameshwar Broota, which was like an entire education in itself,’ he says. Perhaps it is this oblique perspective, which gives Tauseef’s artwork its distinctive edge. Through the striking device of the glass objects as a screen to view monuments, he unpeels several layered themes. “My paintings are about how we view history through the prism of today, how it is constantly shifting and changing according to our contemporary perspectives. The wine glasses are a metaphor for society, how the people we know and come in contact with effect how we perceive the world and our past,” he says. But at the end of the day, the paintings are also special because they as beautiful as they are full of meaning. You can easily see the painter’s deliberate attention to the aesthetic, sensorial elements in each canvass, in the way the solid stone monument contrasts with the transparency and delicacy of the glassware, in the contrast between the monument per se and the monument seen through glass, creating a landscape with its own power, something which keeps the viewer looking.